Day trip to Cadiz: the colonial city of Andalusia. Day trip to Cadiz: the colonial city of Andalusia. The discovery of the Americas in 1492 by Christoph Columbus was a key historical fact for the city of Cadiz. The second and fourth expeditions of the brave discoverer set sail from the port of this unique town and in 1717, the city held the monopoly of all trade with the New World, that was formerly established in Seville. This attracted many wealthy merchants from different parts of the world who settled down in the city. Cádiz experienced then some very important changes and quickly became an exclusive cosmopolitan hub for the emerging international bourgeoisie. The city keeps many of the lavish colonial palaces that were built at that time as well as some unique pieces of art. Highly renowned painters of that period were commissioned by the most sensitive merchants to decorate their homes and places of devotion. With this tour we will enjoy the beauty and magnificence of Colonial Cadiz by walking through the streets, squares and parks of the quarters where the wealthy merchants used to live. We will also venture into some unique buildings to discover the city’s best kept art and interior architecture secrets. Cadiz is also famous for being a tapas paradise. we will help you to understand why by taking you to two wonderful bars serving delicious local specialities. 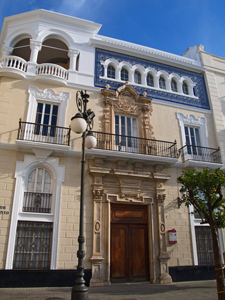 This day trip is ideal for people staying in other locations in Andalusia wishing to visit Colonial Cadiz in one day. It includes private transportation in a modern and comfortable vehicle with A/C to and from your accommodation. Your personal guide and driver will pick you up in the morning and will drive you back in the late afternoon after spending a great day together in this undiscovered gem of Andalusia. Prices: start at 80 Euros per person (incl. VAT) for a group of 8 people.